James Bond Island, known originally and locally as Ko Tapu or Nail Island, found fame through the 1974 Bond film "The Man with the Golden Gun". The film starred Roger Moore and Christopher Lee (as the three nippled arch-villain Scaramanga) but it was the scenic island topography that helped make the film into a firm Bond favourite. 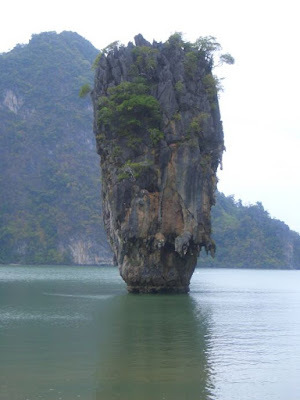 It also turned the previously unknown Phang Nga Bay in Thailand into a major tourist attraction with James Bond Island Tours continuing to be a popular day trip from Phuket and Krabi to this very day.